This is a perfect meal for these cold nights we have been having. 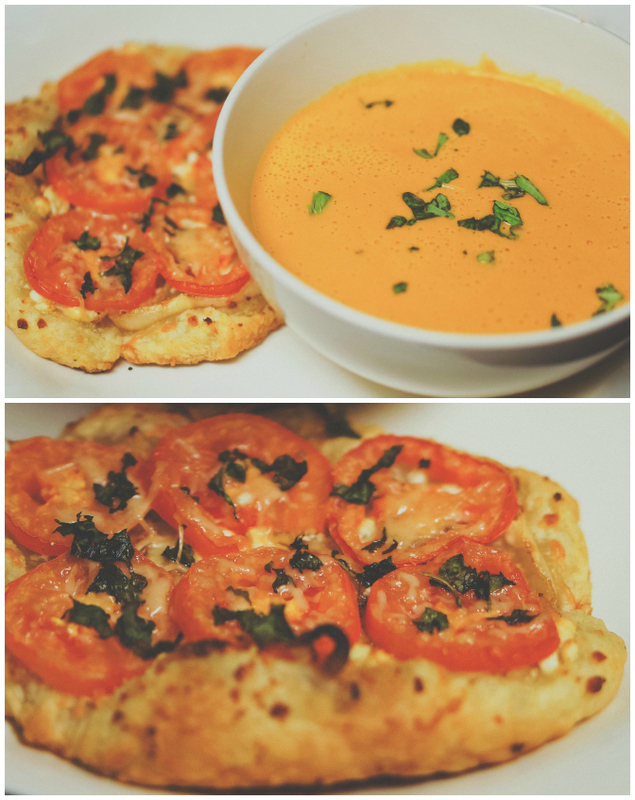 I already want to make it again, and I think the butternut squash is the secret to making good tomato basil bisque. No need to go to Zupas....I don't recall them having a Feta and Tomato Tartlet. Enjoy! Prepare the butternut squash by preheating the oven to 350 degrees. Cut the squash in half, lengthwise, so you have two long pieces. Scoop out the seeds and pulp from each half. Place both sides cut-side down in a 9X13-inch pan. Add enough water to come about 1/4-inch up the sides of the squash. Cover with foil and bake for about an hour. Test with a fork to make sure the squash is very tender when pierced with the fork in several places. If the flesh doesn’t easily give to the pressure of the fork, continue cooking in ten minute increments, and testing again, until the squash is tender. Remove the pan from the oven and transfer the squash to a large cutting board or plate. Let it cool about 15 minutes before scooping out the flesh. If preparing the day before, scoop out the flesh and place in a tupperware. Let cool completely. Cover and refrigerate until using it in the soup. If using the squash immediately, scoop the squash into the blender. While the squash is cooking, in a medium saucepan, melt the butter and saute the onion until soft and translucent. Add the minced garlic and cook, stirring constantly, until fragrant, about 30 seconds. Scoop the onion/garlic mixture into the blender with the squash. Add the canned tomatoes (undrained) to the blender. Process until the mixture is smooth. Pour the blended mixture back into the saucepan and add the chicken broth, salt, sugar, basil and cream (or half-and-half). Stir to combine well. Heat over medium-low heat until the soup is warm (but don’t let it boil or simmer to avoid the cream curdling). Serve immediately. Preheat oven to 400 degrees. Slice onion. Over medium-low heat, sauté onion in olive oil until caramelized, about 20 minutes. While onions caramelize, slice tomato and cut circular pieces of pastry by running a knife around the edge of a small bowl or plate. When onions are done, place about one tablespoon on each pastry round, followed by crumbled feta, then 1 or 2 tomato slices, and sprinkle parmesan on top. Sprinkle a little basil on top. Bake for 25 minutes. I couldn't find a sheet of puff pastry dough. Instead, I just bought the puff pastry shells found near the pies. I took them out and let them thaw, and then combined three shells into a ball and rolled it out into an oval shape. So one box of the shells had 6. That gave me two good sized tartlets. PI DAY, AND ALSO IT WAS WARM OUTSIDE. LADY LUND ALL RIGHTS RESERVED. Powered by Blogger.